Markita Hawkins joined Bruno and Bruno in 2016, and her warmth, energy and skill as a communicator have made her a powerful advocate for clients. She focuses on automobile accident and class action cases, and also supports the firm through case reviews and consultations. Her work on more than five hundred individual and business claims following the BP Deepwater Horizon oil spill has resulted in millions recovered for victims. She is the first point of contact for many of our clients, and her empathy and ability to connect with clients make her an invaluable member of Bruno and Bruno. Before joining Bruno and Bruno, Markita worked at a leading class action, mass tort and bankruptcy administration firm in New Orleans. While earning her J.D. at Southern University Law Center, she was involved in criminal, juvenile justice, family and administrative law cases in the university’s legal clinic. 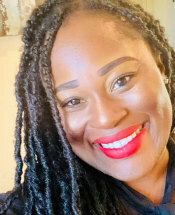 A New Orleans native, Markita is a member of the Louisiana Association for Justice and participates in the Louisiana State Bar Association Lawyers in Libraries pro bono week.